Legacy radar systems used in traffic control and weather stations use synchronous data communications to convey the data from the radar antenna to the display stations. 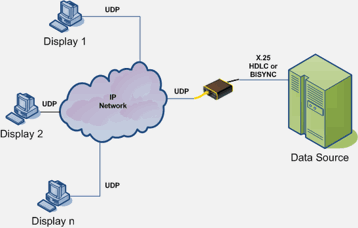 We have seen all kinds of underlying protocols including Bisynchronous, HDLC, HDLC/LAPB and even X.25. We have seen old systems that use 13 bit words. But the need has always been the same: Get the data from the radar station and make it available to multiple display stations. Sometimes included is the need to record the data for later playback. Airports now have intranets available, so it makes sense to use our PXSe to convert old communications to modern ones. With this purpose in mind, we developed the broadcast family of applications. They all work the same way. 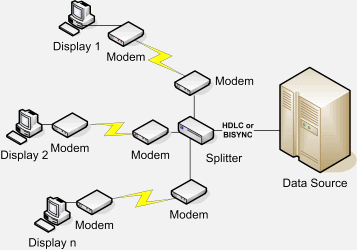 They connect the PXSe to the synchronous port of the radar equipment using one of the protocols mentioned above, extract the data, and send it to the workstations via IP multicast.